OUR EXPERTS ARE TRAINED TO SPOT WHAT OTHERS MIGHT NOT SEE. Ford-Trained Experts have over a million hours of combined training nationwide. This enables them to spot subtle nuances that differentiate tires and determine which set will fit your vehicle, local conditions, and driving habits perfectly. Plus, if you find an advertised price that is lower than ours, we’ll match it49. This way you get the best price and the best in service. Participating locations also offer convenient tire storage57 for when you need to store your extra set of tires. A COMBINED MILLION HOURS IN FORD-TRAINING HELPS OUR EXPERTS GET IT RIGHT. • They’re designed to fit with no additional hardware or machining required. • They’re engineered to dramatically reduce noise and dust. 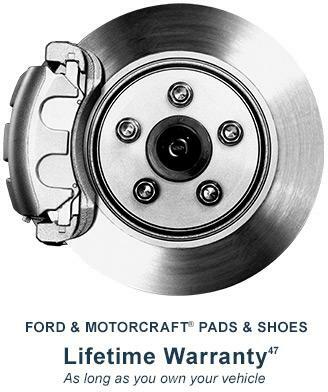 • They’re installed by Ford-Trained Technicians with over a million hours of combined training nationwide, who know your Ford better than anyone else. Motorcraft® is a registered trademark of Ford Motor Company.